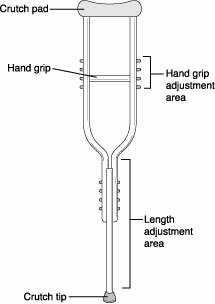 Crutch pad distance from armpits. The crutch pads (tops of crutches) should be 1.5" to 2" (about two finger widths) below the armpits, with the shoulders relaxed. Handgrip. Place it so your elbow is flexed about 15 to 30 degrees—enough so you can fully extend your elbow when you take a step. Crutch length (top to bottom). The total crutch length should equal the distance from your armpit to about 6" in front of a shoe. If your foot and ankle surgeon has told you to avoid ALL weight-bearing, it is important to follow these instructions carefully. You will need sufficient upper body strength to support all your weight with just your arms and shoulders. The tripod position is the position in which you stand when using crutches. It is also the position in which you begin walking. To get into the tripod position, place the crutch tips about 4" to 6" to the side and front of each foot, then stand on your "good" foot (the one that is weight-bearing). 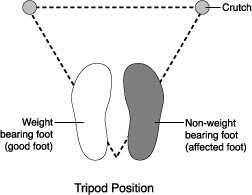 Begin in the tripod position—and remember, keep all your weight on your "good" (weight-bearing) foot. Move the "good" weight-bearing foot/leg forward (beyond the crutches). Make sure the chair is stable and will not roll or slide—and it must have arms and back support. Hold on to the crutches (on one side) and the chair arm (on the other side) for balance and stability while lowering yourself to a seated position—or raising yourself from the chair if you're getting up. The safest way to go up and down stairs is to use your seat—not your crutches. If this isn't possible, place crutches as far up the stairs as you can—then move them to the top as you progress up the stairs. Move your crutches downstairs by sliding them to the lowest possible point on the stairway—then continue to move them down as you progress down the stairs. Don't look down. Look straight ahead as you normally do when you walk. Don't use crutches if you feel dizzy or drowsy. Don't walk on slippery surfaces. Avoid snowy, icy, or rainy conditions. Don't put any weight on your foot if your doctor has so advised.